People could always use a reason to explore things they don’t normally think about. Recently, some articles circulated that talked about something referred to as “OOPArts”: an “out-of-place artifact,” which is basically a metal or stone item, an ancient artifact that is recovered in a very bizarre place. Usually OOPArts are dated to very old times, hundreds of thousands or millions of years old allegedly, though the veracity of those claims might need some investigation. They say an out of place artifact is an artifact of paleontological, historical, or archaeological significance recovered in a strange place, that usually challenges the mainstream narrative of history by suggesting that human beings were much more advanced at a particular time. Our innate curiosity and desire to know the past makes this topic probably capture the imagination of any average person. A lot of these out of place artifacts are found inside coal for some reason. Just stuck inside a block of coal: people recover strange items that are alleged to be hundreds of thousands of years old, that they find lodged inside coal. If you think about it, coal and oil are both kind of archetypal powerful materials on planet Earth. If there were some past civilizations of humanity we were never told about, wouldn’t evidence of their existence possibly not be far from vast reserves of resources we both value as human beings? “The scientific society will never admit that these artifacts are authentic. If they do so, it would be to admit that they are completely wrong about our origins. Thus, they will need to invalidate all the text books used to educate us. However, sometimes when fake artifacts are insisted to be real when they are fake, the fraudsters with the artifact might use this fact to claim that the mainstream won’t recognize the disingenuous item they presented. Here are a couple stories of out of place artifacts. In 1968, Stan Taylor, a Texan paleontologist claims to have discovered fossilized dinosaur footprints in the Paluxy riverbed, near Glen Rose, Texas. It is claimed that parallel to the dinosaur footprints, were well preserved human footprints. The scientific community likes to debate the claim, and call it an argument of “creationists” but they didn’t really debate that the dinosaur tracks were real. Since that point, several other cases of human footprints sitting alongside dinosaur tracks have been reported around the planet. It is claimed that for the past couple decades, mysterious metal spheres have been dug up by miners in Western Transvaal, South Africa: the little town of Ottosdal. They claim two distinct kinds of sphere have been found. One is a hollowed out sphere with some strange spongey, white substance in the center, and the other type is alleged to be a solid, bluish metal thing with white specks. Some say the spheres are so “delicately balanced,” probably very spherical that they would need to be made in a “zero gravity environment.” However, the pictures do not make them look very perfectly spherical. They are called the Klerksdorp spheres. Max Hahn and his wife Emma claim to have been hiking next to a waterfall in London, Texas in midsummer 1936, when they found a rock with an elongated piece of wood protruding from it. When they cracked it open, they found some kind of ancient hammer. It is said that archaeologists analyzed it and concluded it was over 500 million years old. The Idaho Ancient Clay Figurine. Boring into an artesian well in 1889, some workers stumbled upon a small clay-baked figurine from a depth of 320 feet near the town of Nampa, Idaho. 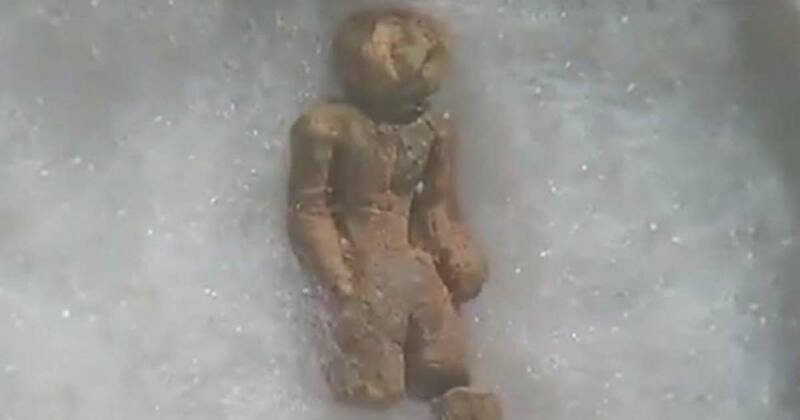 Through over 15 feet of basalt lava and much more, these workers recovered a mysterious clay figurine that looked like a child’s toy. The top layer of the basalt lava was dated to at least 15 million years old..! Is this one too good to be true? Newton Anderson, a ten year old boy in 1944 is reported to have dropped a lump of coal. It broke in half, and inside it was a hand crafted brass alloy bell, complete with a sculptured handle and iron clapper. An analysis reported that it had an unusual composition of different metals, and it was estimated to be a whopping 300,000,000 years old. Another strange item was found in a big limp of coal by a worker in Wilburton, Oklahoma in 1912. It was a cast iron pot! They claim it was 300 million years old. How many times has the rise and fall of civilization occurred? For a long dive into the rabbit hole, watch this presentation about it.